Korea’s Daegu Gyeongbuk Institute of Science and Technology (DGIST) researchers have fabricated nano-sized catalysts that could improve the performance and production of clean energy fuel cells. 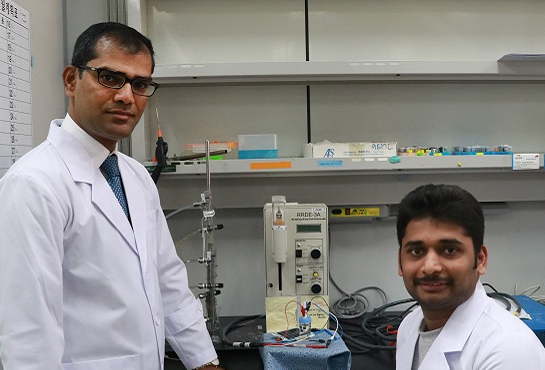 Professor Sangaraju Shanmugam (left) and Ph.D Student Arumugam Sivanantham (right). Image Credit:Daegu Gyeongbuk Institute of Science and Technology. Click image for the largest view. The team’s study results have been published in the journal of Applied Catalysis B: Environmental. Polymer electrolyte membrane fuel cells (PEMFCs) transform the chemical energy produced during a reaction between hydrogen fuel and oxygen into electrical energy. While PEMFCs are a promising source of clean energy that is self-contained and mobile – much like the alkaline fuel cells used on the US Space Shuttle – they currently rely on expensive materials. Also, the substances used for catalyzing these chemical reactions degrade, raising concerns about reusability and viability. The fibers were made using a technique known as electrospinning, in which a high voltage is applied to a liquid droplet, forming a charged liquid jet that then dries midflight into uniform, nanosized particles. The researchers’ analyses confirmed that the ceria and cobalt particles were uniformly distributed in the carbon nanorods and that the catalysts showed enhanced electricity-producing capacity. The researchers concluded that ceria could be considered among the most promising materials for use with cobalt on nitrogen-doped carbon nanorods to produce stable catalysts with enhanced electrochemical activity in PEMFCs and related devices. Its more good news for the fuel cell field. Things are coming strongly enough and with enough improvement that an engineer has to wonder if a design is obsolete before it can be prototyped. This may only be a lab sample, but the potential demands a larger sized sample look. Hopefully, it can be helpful to the fuel and environment with the stable catalysts.